Skincare boosters are specialised products that contain a high concentration of a single type of ingredient, such as vitamin C or, for example, a blend of non-fragrant plant oils, along with supporting ingredients that enable the main ingredient(s) to be even more effective. Adding one or more boosters to your routine allows you to customise your skincare routine and get visible results you'll find impressive. 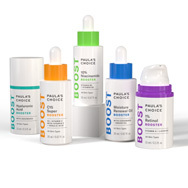 Paula’s Choice Skincare boosters are formulated to work together with each other and are designed to layer easily with other leave-on products in your skincare routine. To help you learn how to combine our boosters for enhanced results for your specific concerns, we’ve written some booster recipes. One of these might be the “secret sauce” that takes your results to the next level. Let’s get cooking! How to: After cleansing, toning, and exfoliating, apply 3-5 drops of C15 Super Booster to entire face, adding a bit more if needed. Next, apply a pea-sized amount of 10% Azelaic Acid Booster where needed. Follow with your serum, moisturiser, and eye cream. Add some spice: If enlarged pores are also a concern, add a few drops of the 10% Niacinamide Booster to the mix by applying after C15, then follow with 10% Azelaic Acid Booster and the rest of your routine. How to: After cleansing, toning, and exfoliating, dispense 2-3 drops of the Retinol Booster into the palm of your hand. Next, add a pearl-sized amount of Peptide Booster. Mix the two with your fingertips and apply to your face and neck. Follow with your serum, moisturiser, and eye cream. Add some spice: Enhance a firm feeling around the eyes and reduce the look of fine lines and wrinkles by dabbing on a visible layer of RESIST Anti-Aging Eye Cream to end your nighttime skincare routine. How to: After cleansing, toning, and exfoliating, dispense 2–3 drops of the Retinol Booster into the palm of your hand. Next, add 3–5 drops of the C15 Booster. Mix the two with your fingertips and apply to your face and neck. Follow with your serum, moisturiser, and eye cream. Add some spice: A dash (a few generous drops) of Peptide Booster helps smooth the look of fine lines and wrinkles while hydrating and visibly strengthening skin's resilience. How to: After cleansing, toning, and exfoliating, dispense 2–3 drops of the Niacinamide Booster into the palm of your hand. Add an equal amount of the Retinol Booster, mix them together with your fingertips, and then smooth over your face, focusing on areas with visible lines and large pores. Add some spice: If your skin is dry or dehydrated—including seasonal dryness—finish your routine by massaging 2–3 drops of Moisture Renewal Oil Booster over dry areas, including around the eyes. Dry, but not that dry? Follow with a few drops of the Peptide Booster to smooth and soften the appearance of wrinkles. How to: After cleansing, toning, and exfoliating, dispense 3–5 drops of the Hyaluronic Acid Booster and apply to your face and neck. Dispense a pearl-sized amount of the C25 Super Booster and spot-apply to discolourations. Optional: Add a bit more C25 Super Booster to larger areas where skin tone appears uneven. Add some spice: Dispense 3–4 drops of the Niacinamide Booster and apply to face and neck after the Hyaluronic Acid Booster. Niacinamide helps strengthen skin against moisture loss and further improves the appearance of discolourations and uneven skin tone. How to: After cleansing, toning, and exfoliating, dispense 2–3 drops of the Niacinamide Booster and smooth over your face and neck. Follow with 2–3 drops of the Oil Booster, applied to dry areas, including around the eyes. You can also mix the Oil Booster with your facial moisturiser and apply this blend to face and neck. Add some spice: Mix in a pea-size amount of Hyaluronic Acid Booster with the Niacinamide Booster, and then apply a few drops of the Oil Booster, including around the eyes. How to: After cleansing, toning, and exfoliating, dispense 2–3 drops of the Niacinamide Booster into the palm of your hand and apply to face and neck. Next, dispense a pea-sized amount of C25 Super Booster and dab on blemish-prone areas and post-acne marks for more even-looking skin. Optional: Add a bit more C25 Super Booster (try mixing it with your nighttime moisturiser) for larger areas of blemishes or uneven skin tone. Add some spice: Dispense a pea-size amount of RESIST BHA 9 and apply to clog-prone or bumpy areas to improve skin texture.